Over the last couple of years I have become a little bit obsessed with baking – shows like the Great British Bake Off have made it seem so simple to produce amazng cakes easily. Alas, I do not yet own a Kitchen Aid (which obviously will solve all of my kitchen problems), do not have a huge kitchen in a marquee and don’t have an entire day to dedicate to one cake. 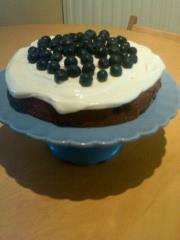 This hasn’t deterred me from baking, but has made me very selective over the reciepes that I choose to even to attempt. 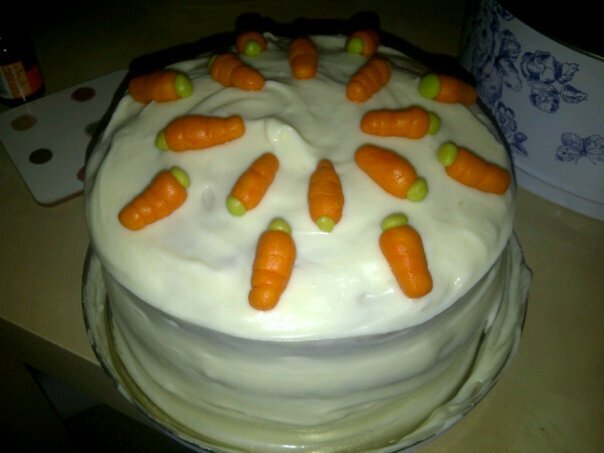 The Hummingbird bakery carrot cake is a fave as it always turns out looking great (even without the marzipan carrots which are very fiddly and annoying – but the only photo I can find is from the day I spent hours making tiny carrots! ), but it’s pretty high on the faff scale – grating 300g of carrots takes a while! So, for church-weekend-away-at-home-garden-party-indoors-because-of-the-rain, on Sunday I branched out and tried a new cake … and it is literally the easiest c ake to make in the world! It’s called a Blueberry Soured Cream Cake, and I pretty much followed the receipe on the good food website, but used frozen blueberries to bake into the cake (so much cheaper). It takes minutes to mix, no hand mixer required, and yet looks and tastes like it took hours! Have you ever sat in a talk thinking “man I wish (s)he’d hurry up and finish”? I don’t think it’s just me…but be free to tell me otherwise! I remember going to a conference a few years back and afterwards everyone raving about how good the speaker was. And he was … I guess. But I did spend a good half of his talk wishing he’d hurry up and shut up. That’s not to say he was rubbish necessarily but I really did get bored. I’ve not had that on the same sort of scale since but there are still times when people at the end of church are like “wow that’s amazing” and I’m like “meh, was ok”. And, I don’t think the problem lies with the preachers necessarily either. Now, that’s not to say that don’t have a responsibilty to make sure that they are engaging with their audience and being relevant, because they absolutely do. But I think we so often forget that those that are listening have a responsibilty too. So often when I get bored in a talk (which to be fair isn’t as regularly as this post is probably making out it is!) I think, ugh [name] is boring and this isn’t a good preach. Where as actually what that is reflecting is where my heart is. If I’m feeling really lethargic about my faith and not really interested in hearing from God, then it’s amazing how rubbish I then see sermons as! Also, surely we each see different talks as being good/brilliant/amazing depending on what we learn from it? Which is again is kinda down to us. The preacher has a responsibility to apply the bible well, sure, but if I’m not going to church or a conference wanting to hear from God, to have my soul refreshed, well again it’s showing where my heart is, isn’t it? Too often we think that listening to the Bible being taught is a passive thing. We just sit back and listen and God does all the work in us and that’s it. It’s like a having a minor op every week. Sit down, stay focused and then it’s all over in half hour or less. So what does make a good talk? One that is well prepared. And not just by the preacher. If we really want to sit under God’s word then surely we need to prepare ourselves for it? We need to be ready to hear God’s word and willing to take it however hard it may be and apply it? We need to be actively listening and not just thinking it’l be over soon and wondering what we’re going to spend our afternoon doing. I guess this then means the way in which we approach sundays changes. Giving time and thought to the passage beforehand is one way of preparing and praying God would speak to us in his word. And then, even if the sermon is boring, unengaging and culturally irrelvant we still have read God’s word for ourselves and started to apply it to our own situations. The irony of all this is that this chain of thinking was set off by really enjoying the sermons at church the last couple of weeks! * i never know what to refer to the talk as. Is it a preach, a talk or a sermon?! Does it depend on your setting? Your denomination? Who’s doing it? So confusing!